Blended (also called hybrid) classrooms, in which face-to-face interaction is intentionally combined with online activities to aid student learning, are becoming more and more common. Most recently, “flipped” classrooms have become a popular method for teaching because more time for active learning in-class can be gained by moving content delivery such as lecture to outside-of-class homework using technology tools such as video or lecture capture. The blended model is proving to be an environment that provides more self-directed, technology-mediated learning experiences for students who will be incorporating technology more and more into their professional lives post-college. The Blended Course Design Workbook meets the need for a user-friendly resource that provides faculty members and administrators with instructions, activities, tools, templates, and deadlines to guide them through the process of revising their traditional face-to-face course into a blended format. Providing a step-by-step course design process that emphasizes active learning and student engagement, this book will help instructors adapt traditional face-to-face courses to a blended environment by guiding them through the development of course goals and learning objectives, assignments, assessments, and student support mechanisms with technology integration in mind. It will also help instructors choose the right technologies based on an instructor’s comfort level with technology and their specific pedagogical needs. The book will help each instructor who uses the text to develop a unique course by making choices about their course design based on student learning needs for their chosen topic and discipline. Every component of the workbook has been piloted with faculty designing and implementing blended courses and then revised to better meet the needs of faculty across a range of comfort levels with technology use. The Blended Course Design Workbook includes detailed instructions for each stage of course design alongside specific activities that the reader can complete. The book is unique because it facilitates a step-by-step process for blended course design with specific templates and tools that can be used across disciplines. Additional resources and handouts are posted on the book page as well as the author website, www.bcdworkbook.com. “The Blended Course Design Workbook: A Practical Guide is a very useful guide for instructors transitioning from traditional to blended delivery. Linder explains how to write course goals and objectives, how to assess students online, and how to design effective learning activities. She also explains how to use technology to support learning, how to access suitable online resources, how to organize blended courses, and how to support online learners. 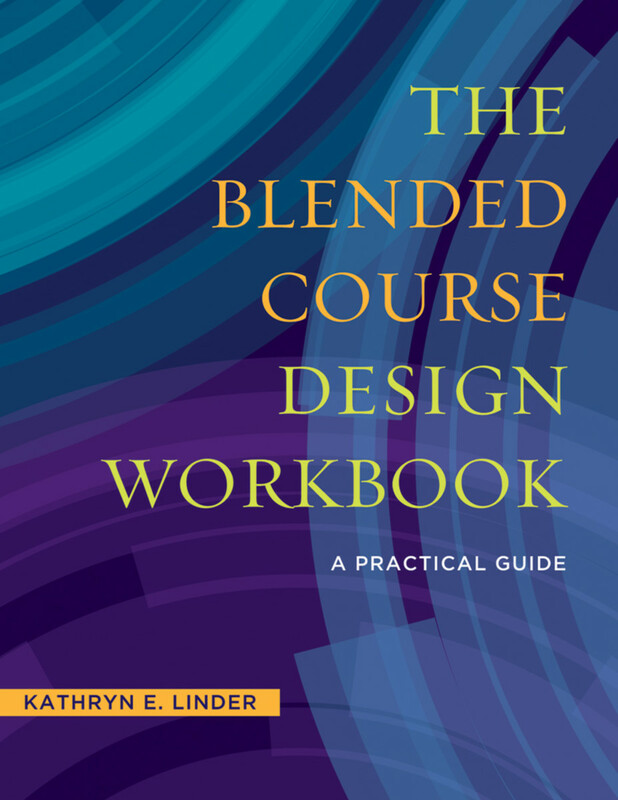 "For the faculty member transitioning a course from face-to-face (F2F) to an online or blended learning environment, Kathryn Linder’s workbook is a wonderful resource. After opening with chapters reviewing the key components of backward course design, developing appropriate course learning objectives, and assessment, the remaining chapters provide a step-by-step guide for an instructor to convert a course from a physical to a virtual teaching space. The book’s main strength is its highly practical nature, highlighted by the ready-to-use worksheets, templates, and checklists for every step in the process. Not only does it explain the desired resources, it usually gives real-life examples of how the tool was used in a blended classroom effectively. Introduction: Why Blended, Why Now?